We started seeing these flags and firetrucks all over the over passes in St.Catharines. 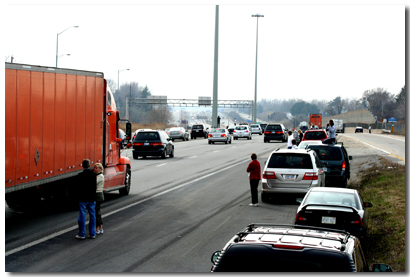 As we approached the outskirts of town the crowds got bigger, everyone on the QEW slowed down to a stop - people were standing in the highway! 8 lanes of highway. We pulled over too and it was an incredible solemn moment. I'm not sure what I think of war - or rather I am very sure sometimes and not so sure other times...but I do know that to honour someone like this was incredible. It also struck me at humanity's search for meaning - out there on the highway was an entire community's response to atheism - there was a longing that something would mean something. That this person didn't die in vain, or die without meaning, and people wanted to be a part of that meaning. 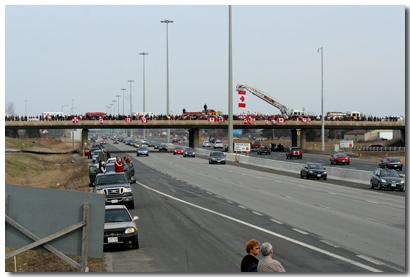 There is no way that all of these people standing on the highway knew Cpl Crooks - they just wanted to be a part of something meaningful and respect his family. Pretty intense moment and cause for a lot of thought - how much meaning do we give life? How much meaning do we offer through Jesus to people around us?